DANVILLE, IN (February 11, 2016) - Today, the Hendricks County Tourism Commission in partnership with Sun Companies announced a multi-million-dollar agreement that will bring an Embassy Suites Hotel and Conference Center to Plainfield&apos;s I-70 interchange just minutes from the Indianapolis International Airport. The project will be developed on land owned by the Tourism Commission at the intersection of Perry and Clarks Creek roads. 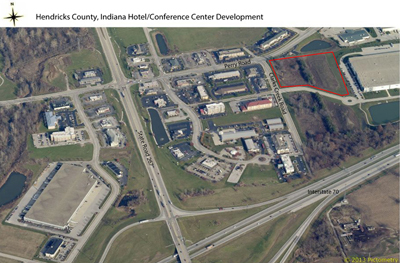 The Commission has owned parcels with the intent to incentivize a hotel and conference center development since 2005, and this project will utilize more than 8 acres of that Plainfield property. "The Commission&apos;s objective since we purchased the land over 10 years ago was to attract a project of this scope," said Jaime Bohler Smith, executive director of Visit Hendricks County. "We couldn&apos;t be more pleased with this agreement and its significance to the future of tourism in this county as it will be a major destination driver to our community." 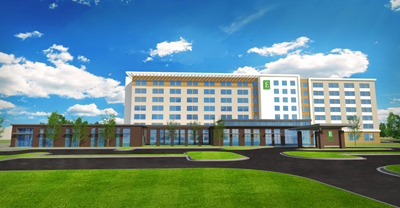 The 175-room Embassy Suites hotel will have a minimum of 5,000 square feet of meeting space within the hotel, and another 20,000 square feet of conference space attached as well as a full-service restaurant and numerous other amenities. The project will employ nearly 50 people, and have an annual payroll of nearly $1.5 million. Construction is anticipated to begin no later than October 2016, with completion scheduled for 2018. "We&apos;re thrilled to be bringing this level of hotel to Hendricks County," said Suraj Patel, president of Sun Companies. "We have a 25-year history of working with communities across Indiana to bring the highest caliber of hospitality properties and help those communities continue to grow and attract businesses." The Hendricks County Council today approved a preliminary resolution to set the deal in motion by offering a $6 million bond supported by the county&apos;s innkeeper&apos;s tax. The local 8 percent innkeeper&apos;s tax is paid by visitors when they rent an overnight room in the county, and the funds currently support the operations of Visit Hendricks County, as well as county park developments and the county fairgrounds. The amount pledged to bond payments annually is approximately 20 percent of the total amount collected. Funds for the county parks and the county fairgrounds remain at the same commitment, which is also approximately 20 percent of the total amount collected. The $6 million reimbursement includes $5 million for the development of the conference center space and $1 million for the purchase and development of the land. Once operations begin in 2018, the hotel and conference center is expected to generate $6 million in room revenue and an additional $480,000 in innkeeper&apos;s tax annually, according to Bharat Patel, chairman of Sun Companies. "I-70 and Indiana 267 is the western gateway for Indy Metro, and since the relocation of the Indianapolis International Airport terminals, the interchange has become the primary lodging cluster for the airport but lacks an upscale, full-service hotel with sizeable banquet facilities," Bharat Patel said. "This project will fulfill all of that by providing a facility with a quality restaurant, conference space and more." In addition to the request from the county, officials in the Town of Plainfield are considering a request for a partial tax abatement of the hotel and conference center project over 10 years. "Our statistics and recent feasibility studies show that we need full-service lodging and attached meeting space to meet the growing demand of business travelers, especially with our proximity to the Indianapolis airport," Smith said. "We are bringing in a new property tier, that we do not have anywhere in Hendricks County. This project will elevate all the properties, and make the destination sustainable over a longer period of time while further enhancing that interchange as a hospitality gateway here on the west side of the city. "The economic impact will be felt throughout our community in not only other hotels, but restaurants, shopping and locally owned businesses," she added. Hendricks County continues to experience year-over-year growth with significant gains in lodging revenue including an increase of 3.9 percent in 2015 over 2014. About Sun Companies: Sun owns 32 hotels in 12 states including four Embassy Suites and has five hotels under development in New Jersey, Oklahoma and Kansas as well as a full-service hotel in Noblesville, Ind. CEO Bharat Patel received the 2008 and 2010 Hilton Hotels Developer of the Year for the Embassy Suites brand and 2009 Hilton Hotels Family Developer of the Year. Sun Companies is headquartered in Indianapolis. About Embassy Suites by Hilton: Embassy Suites by Hilton, one of Hilton Worldwide&apos;s twelve market-leading brands, is dedicated to delivering what matters most to travelers. The full service, upscale brand offers two-room suites, free made-to-order breakfast and a nightly two-hour reception with complimentary drinks and snacks. Both leisure and business travelers looking for a relaxed, yet sophisticated experience will feel right at home with brand-standard amenities like inviting atriums and complimentary 24-hour business and fitness centers. Embassy Suites by Hilton has over 220 hotels with more than 40 in the pipeline. Hilton HHonors members who book directly through preferred Hilton channels have access to benefits including free standard Wi-Fi, as well as digital amenities that are available exclusively through the industry-leading Hilton HHonors app, where HHonors members can check-in and choose their room. For more information, visit www.embassysuites.com, and connect with Embassy Suites by Hilton at news.embassysuites.com, www.facebook.com/embassysuiteshotels and www.twitter.com/EmbassySuites. About the Hendricks County Tourism Commission d/b/a Visit Hendricks County: Visit Hendricks County attracts visitors to the county by promoting and developing tourism, which stimulates economic growth and enhances quality of life. Find us on Facebook at Facebook.com/VisitHendricksCounty and become a fan for updates and reminders, contest info and much more. You can also follow us on Twitter @HendricksCounty or get updates by following or subscribing to our tourism blog at VisitHendricksCounty.com/blog. For more information, visit our website at VisitHendricksCounty.com or call (317) 718-8750.